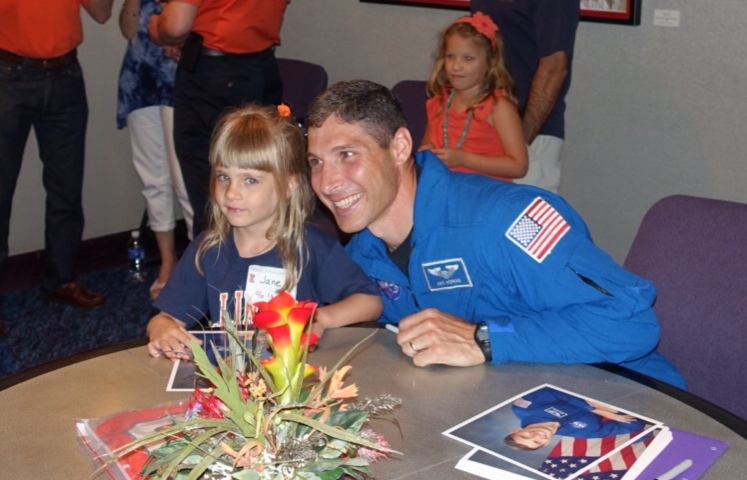 On Saturday, June 21, the Houston Illini Club hosted astronaut and alumnus Mike Hopkins and tour Space Center Houston. Three months ago Mike returned from a very successful six month mission on the International Space Station. And just last month, he delivered a fantastic commencement address to Illinois' 2014 graduating class. What an honor to have him with our very own alumni club! The day started with a large-group gathering in the space center’s theatre to watch an introductory film and hear some first word’s from the astronaut himself. Mike took a lot of his own video during his time on the ISS and shared that with the large group. He took almost an hour to share his experiences and answer questions to the group – all while wearing his blue NASA jumpsuit! Following the presentation, the club had a private room reserved to mingle with Mike for another hour. There were about 60 alumni and their families attend and many children. Mike was so positive and such a great person to talk to. He shared personal stories from the space station and continually emphasized how impactful the University of Illinois has been on his life. Club Communucations chair Mark Ulrich shared that this was among the best events he has attended in the 25 years he has been involved with the Houston Illini Club. Congratulations to the Houston Illini Club on a fantastic event and a huge thank you to Mike Hopkins for spending his time sharing his experiences with his fellow alumni! To view photos from the event, check out houstonilliniclub.org.